Part of my daily routine since I moved to Cozumel is going to the grocery store or the local market each morning to shop for my next culinary project (also known as that evenings dinner). The slow, go with the flow pace of life in Cozumel has changed the way I grocery shop. No longer dealing with the constant hustle and bustle of suburban mania at Wegman’s or Whole Foods my grocery shopping has become a more holistic experience. I no longer plan a weeks worth of meals or how I will manage getting through Wegman’s without running over a soccer mom with a grocery cart or backing into a fancy Mercedes in the over crowded parking lot (yes that actually happened). Instead, I write a brief list of the basic supplies that need replenishment (diet coke, yogurt, fruit & coffee) and the ingredients for a meal that inspires me that day. The markets and local grocery store are filled with exotic and unfamiliar fruits and vegetables. Even basic lettuce (lechuga) is exotic simply because the name is in Spanish and it sounds beautiful when it rolls off your tongue. I have even managed to communicate and ask for things in basic Spanish, though I am constantly stumbling upon proper pronunciation and I have much more to learn before I can actually have a “real” conversation. Recently on one my daily shopping trips, this time for the ingredients for mushroom and onion lasagna, as I am starting to crave non-Mexican food (although I did manage to add chorizo to this dish), I was struck by a fruit that looked like it was on fire. This fruit was not only hot pink, but it had petal like spikes outlined in yellow that looked like flames. What made the fruit even more striking was the inside. Pure whiteness spotted with seeds likened to those of poppy seeds. I had to buy it. So I took two and jotted in my iPhone notes the word Pitaya. As soon as I got home I looked up my purchase and how it is used. 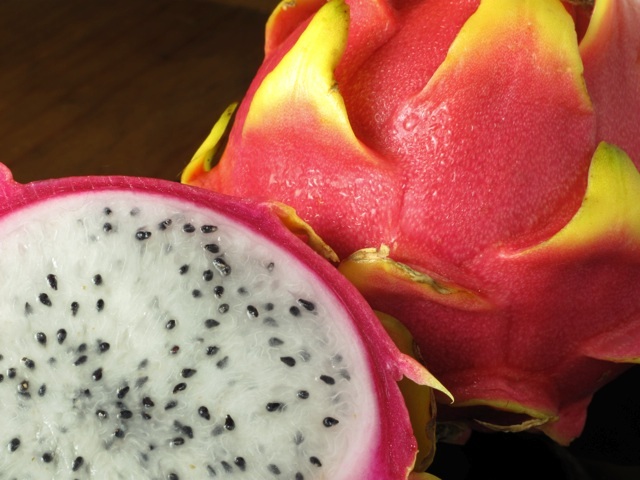 Pitaya, also known as Dragon Fruit (it does look like a fireball from a dragon) is native to Mexico and South America. Pitaya is a fruit of a cactus and not only a typical cactus, but a cactus that only flowers at night. I tried looking up recipes, but my research was “fruitless” (sorry I had to say it). People described it as tasteless, or similar to the texture of a kiwi because of the little black seeds. Essentially the only interesting recipe I found was use it to make Dragon Fruit ice cream, but most results were either eat it alone or use it as an addition to a fruit salad. This was no good as one; I do not have an ice cream maker (hint hint hubby) and two I wanted to make something more interesting than fruit salad. 1. Preheat oven to 350°F and grease a muffin pan (I used a pan for 6 large muffins, but this recipe can make up to 18 medium sized muffins). You can also use foil/paper liners if desired. 2. Combine flour and baking powder in a bowl. 3. Beat eggs with handheld mixer or stand mixer. Add sugar and beat until pale yellow. Add oil and milk and mix thoroughly until frothy. 4. Gently fold in dry ingredients. Do not over mix. Fold in Dragon Fruit. 5. 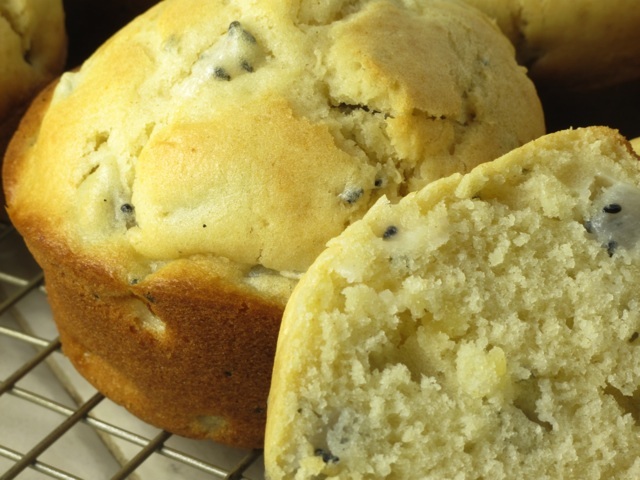 Spoon mixture into muffin pan and bake for approximately 15 min or until tops of muffins are golden. Cool on a wire rack. 6. Serve lightly dusted with powder sugar and butter.